After spending many days visiting The Prabhupada Connection, and seeing many beautiful pictures of Sri Sri Radha Madan Mohan of New Gokula Dhama of Vancouver, Canada, I decided I needed to travel and go and see Their beauty in person. Thanks to The Prabhupada Connection for posting so many nice photos of Their Lordships, and To Jaya Govinda Dasa Prabhu for personally taking these photos. The journey began, and I eventually arrived (many hours of travel) and attended the Sunday Feast, where I went to the Temple immediately to have my eyes fully fixed on Their ever so enchanting beauty. As it was a Sunday Feast time, devotees were greeting me and I had this deep desire to spend my time with the vision of Sri Sri Radha Madan Mohan, so with cutting conversations a little short, I was attracted like a magnet. As Vancouver was my home Temple, where I was introduced to Krishna Consciousness in 1992, I had been in front of the Deities before, but not for many years, or in the way I felt on this journey. The next morning when I arrived for mangala-arotika this is when the true beauty seemed to suddenly be revealed to this undeserving fallen soul. My meditation seemed to become stronger where I was fully captivated by beauty and a presence I had not ever seen before. 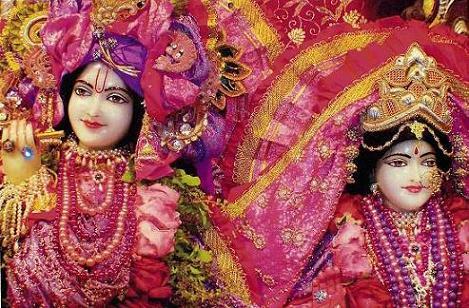 With the form of Sri Sri Radha Madan Mohan before my eyes, suddenly my whole thought pattern began to change rather quickly. After mangala-arotika I was actually supposed to leave and travel to be ready for my few hours of scheduled employment, but decided to delay my departure until the next day. I could not leave so quickly as I was engaged in my whole thought pattern changing, and this needed to be a priority in my life. I then spent more time attending the later arotika offerings in the later part of the day. I would sit alone in the Temple and meditate on Their Lordships' form, and feel so much transcendental energy. And thoughts of the way of thinking about my life were changing. It seemed as if all anxiety or failings of the past were suddenly being removed from my thoughts. It was becoming clearer to me how I should and could utilize my self towards a complete surrender of areas that I was holding on to that really were not going to help me towards achieving devotional service. The next morning I awoke, thinking how this was going to be my last managala-arotika with Sri Sri Radha Madan Mohan, and I wanted this to last as long as possible. I had thought all night of Sri Sri Radha Madan Mohan and how fortunate I was to have this opportunity to think of changing my consciousness. During my last moments with seeing the most beautiful Deities I have ever seen, I was fully reassured of the steps I should take to have my life be more focused on devotional service. It was suddenly quite clear and simple on how this could be actually possible. I needed to do whatever necessary to keep my mind fixed on Lord Krishna as we can retrain ourselves away from the negative and material engaged focus we have become attached to here in the material world. Sri Sri Radha Madan Mohan fully revealed to this fallen lost soul how if we meditate on Krishna we can surpass these obstacles. I am fully thankful for the Mercy I received from visiting the Lovely Sri Sri Radha Madan Mohan. All Glories To Srila Prabhupada for introducing us to the importance of visiting, offering and serving many beautiful forms of Deities in our Temples so we may erase our material attachments. Sri Sri Radha Madan Mohan Ki Jaya !